Hello and welcome back to the El Charrito blog! On our blog, we are always talking about our favorite thing and that favorite thing is food. We at El Charrito are passionate about good food and have been for over the last 30 years. Our authentic Mexican restaurant has even won awards like Best Burrito by Monterey County Weekly. We are honored by this recognition and are proud to serve Monterey with tasty eats and drinks inspired by south of the border flavors. If you are in the mood for something that will satisfy your stomach, delight the taste buds, and fill the soul then you need to come by our Salinas location. You can even order online and if you really love us and want to share delicious food with your friends and family, have us cater your next big event. Now, with all that being said, let’s keep talking about food. The United States is a beautiful place rich with food from cultures all over the world. We are blessed to live in such a place that celebrates all kinds of people and also loves good food. Over the years, many traditional foods have been Americanized and Mexican food is no different. When someone says they want Mexican food, they could be wanting a variety of things: they could want traditional Mexican or Tex-Mex. 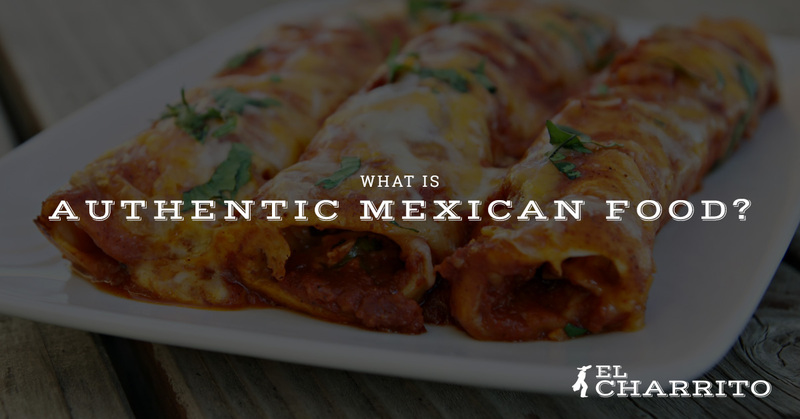 So, what makes certain Mexican food truly authentic? To begin with, most truly authentic Mexican foods are made only with those ingredients found grown or raised in Mexico. Some of those ingredients include corn, beans, tomatoes, cilantro, cotija, and fish. The spices used in authentic dishes are also different. For a dish to truly be considered authentic, it will be prepared with spices that can still be found in Mexico and have been used in true Mexican eats and treats for over 50 years. A great example of how authentic Mexican food differs from Tex-Mex or Americanized Mexican foods can clearly be seen with tacos. Though Tex-Mex is delicious, authentic Mexican food provides more complex flavors made with a larger variety of flavors. If you want to taste the difference for yourself, don’t stop at that chain taco store that used to have a chihuahua dog as its mascot. Stop by El Charrito! We are an authentic Mexican food restaurant offering delicious food at affordable prices all day long. We serve breakfast, lunch, and dinner. Come visit us and enjoy fresh ingredients, vibrant flavors, and food that will fill your stomach and soul.